The Sierra Nevada Corporation's Dream Chaser flight vehicle prepares for ground tests at NASA's Dryden Flight Research Center in California on Aug. 2, 2013. A privately built space plane successfully completed a series of key tests earlier this month, as part of an ongoing effort to judge the winged vehicle's ability to carry astronauts to and from the International Space Station one day. 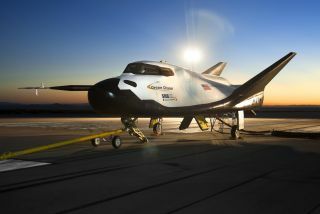 The Sierra Nevada Corp.'s Dream Chaser space plane underwent several "ground tow tests" on Aug. 2 at NASA's Dryden Flight Research Center in southern California. These tests are designed to assess the spacecraft's braking and runway landing systems, according to NASA officials. The results of the ground exercises will help Sierra Nevada prepare for future Dream Chaser flight tests, officials said. "The dedicated Dream Chaser team has been putting the test spacecraft through comprehensive integrated testing on the runway, ramps and hangar of the historic California site, finding issues on the ground and addressing them in preparation for upcoming free flights," Cheryl McPhillips, a NASA official working with Sierra Nevada as part of the agency's Commercial Crew Integrated Capability (CCiCap) program, said in a statement. During the tests at Dryden, a pickup truck pulled the space plane across the runway at four different speeds: 10 mph (16 km/h), 20 mph (32 km/h), 40 mph (64 km/h) and 60 mph (97 km/h). Engineers also monitored Dream Chaser's flight computer and software, its instrumentation — including guidance, navigation and control systems — and the spacecraft's braking, steering and landing gear. "Watching Dream Chaser undergo tow testing on the same runway where we landed several space shuttle orbiters brings a great amount of pride to our Dream Chaser team," Lindsey said. "We are another step closer to restoring America's capability to return U.S. astronauts to the International Space Station." Dream Chaser is one of three spacecraft receiving funding from NASA's CCiCap program, which aims to encourage the development of new American-built spacecraft to fill the void left by the retirement of NASA's space shuttle fleet in 2011. NASA wants at least one such private vehicle to be up and running by 2017. "I look forward to seeing this bird land on the old shuttle runway this fall," McPhillips said. "SNC and our other partners are working diligently to enable this country to safely fly crew from and back to the U.S."
SpaceX and Boeing are also building next-generation spaceships as part of NASA's CCiCap program. Hawthorne, California-based SpaceX is developing a manned version of its Dragon space capsule, which is already providing NASA-contracted robotic cargo flights to the space station. Boeing is working on a capsule called CST-100 that is designed to ferry astronauts to and from low-Earth orbit.